No new coal, oil or gas projects anywhere. We’re calling for a fast and just transition to a Fossil Free world. We are living through the hottest years in human history. Increasingly extreme hurricanes, floods and droughts are destroying our homes and nations. The climate crisis is no longer a future threat: it’s a clear and present danger. Yet, we see a new hope everywhere. In every country ordinary people are showing true climate leadership by speaking out against coal, oil and gas projects, moving their money away from fossil fuels, and building clean, just, renewable energy for all. Through the Paris Agreement, the world’s governments made an historic pledge, to protect our common home, and keep it below 1.5C of warming. But their actions have not matched those words. Countries continue to approve new coal, oil and gas projects, and funnel billions into fossil fuels. So it’s up to us to stand up to the corrupt fossil fuel industry and their political and financial allies and make real the change we seek. Our aspirations are global, and it’s going to take all of us acting together locally, to create the Fossil Free future we need. By signing below, I pledge I will stand for a Fossil Free world, and call on communities, governments and institutions – local and international – to stand with me. Together we must: - Ban all new coal, oil and gas projects, and begin phasing out those that are already built. - Divest from and defund fossil fuel projects. Not a penny more should go to fossil fuels. - Commit to a rapid, just transition towards 100% renewable energy for all. The age of fossil fuels is over. We are ready to create the change. Thank you for joining the Fossil Free movement. I'm going Fossil Free - join me. We’re calling for a fast and just transition to a Fossil Free world. Working together, we will end the use of fossil fuels and transition our world to 100% renewable energy for all. And we are calling on politicians to follow our lead. We are living through the hottest years in human history. Increasingly extreme hurricanes, floods and droughts are destroying our homes and nations. The climate crisis is no longer a future threat: it’s a clear and present danger. Yet, we see a new hope everywhere. In every country ordinary people are showing true climate leadership by speaking out against coal, oil and gas projects, moving their money away from fossil fuels, and building clean, just, renewable energy for all. Through the Paris Agreement, the world’s governments made an historic pledge, to protect our common home, and keep it below 1.5C of warming. But their actions have not matched those words. Countries continue to approve new coal, oil and gas projects, and funnel billions into fossil fuels. So it’s up to us to stand up to the corrupt fossil fuel industry and their political and financial allies and make real the change we seek. Our aspirations are global, and it’s going to take all of us acting together locally, to create the Fossil Free future we need. Ban all new coal, oil and gas projects and begin phasing out those that are already built. Divest from and defund fossil fuel projects. Not a penny more should go to fossil fuels. Commit to a rapid, just transition towards 100% renewable energy for all. The age of fossil fuels is over. We are ready to create the change. Thank You! 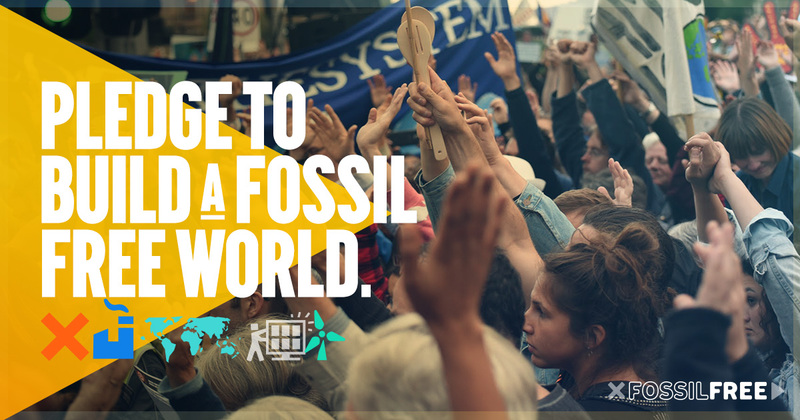 You'll receive an email with more information about ways to get involved where you live and what's coming up soon for the Fossil Free campaign. Stop all new fossil fuel project from being built through local resolutions and community resistance. Accelerate the transition to a new, just clean energy economy by supporting community-led energy solutions. Choke off financing for fossil fuels -- divest, defund + disrupt. Pick big fights with symbolic importance that can inspire and engage millions. At the Brazilian National Oil and Gas Agency pressuring the government for more transparency and responsibility, and highlighting the impacts of oil and gas exploration on climate, biodiversity and traditional communities. Disobedient art can win the fight against artwashing. The proof is right here in black and white.